This guide will assume that you are familiar with the normal version of this encounter. You can read my own guide to this fight here. Naturally, Festergut gains additional health in the heroic version. The main difference between the heroic mode of this encounter and the normal mode that you’re accustomed with is an additional ability. Luckily, it’s an ability that you’ll already be familiar with from the Professor Putricide fight. Throughout the encounter, Professor Putricide will be sat on a ledge, throwing Malleable Goo at your raid. 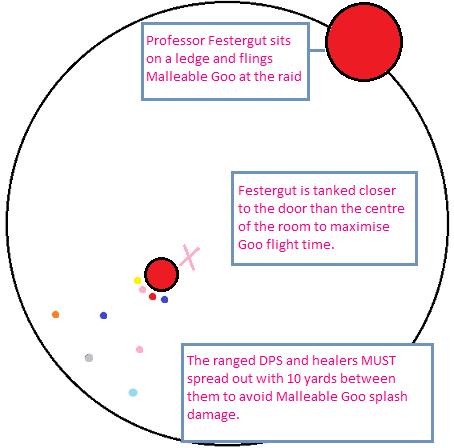 While the Malleable Goo is targeted at one member of your raid, it has a splash damage that is larger than the spell effect. Due to this, it’s vital you leave a large distance between yourself and the “puddle” that the Malleable Goo leaves on the ground. It’s extremely important that you do not get hit by the Malleable Goo. If you are hit, you’ll receive a debuff that slows casting speed (or attack speed) by 250% for 12 seconds. 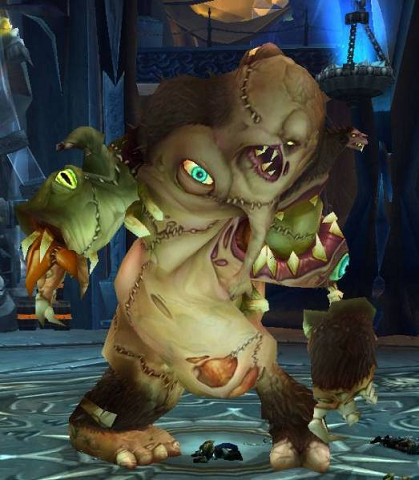 Just as Festergut was a DPS race in it’s normal variation, it remains so in it’s heroic version. 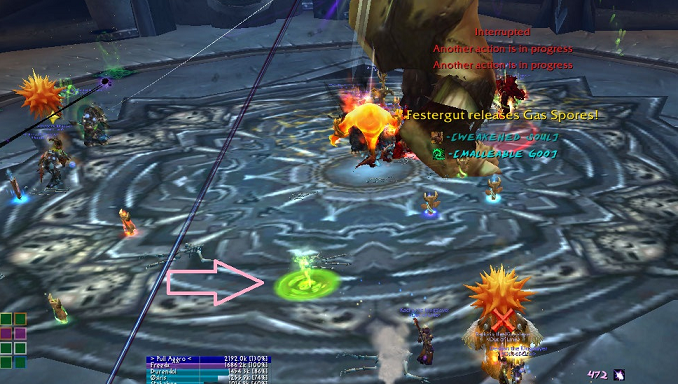 As such, DPS being hit by the Malleable Goo can result in the raid missing the enrage timer. Alternatively, healers being hit my the Malleable Goo can result in tank deaths. Malleable Goo does have a flight time, it’s flung from a platform at the far end of the room and the puddle graphic appears prior to the spell hitting. In order to give the maximum amount of flight time (and thus allowing your raid members the longest period of time to react and move), we tank Festergut closer to the door than usual on normal mode. The encounter is otherwise unchanged. That means the Gas Spore mechanic is unchanged and your raid will still need to move to ensure that everyone gets inoculated from the blight. It’s therefore more important than usual that your raid members return to their designated spots as soon as they receive the inoculation. If they fail to move, or move to slowly, the result can be your raid members being hit by the Malleable Goo. The above screenshot captures the two mechanics (Gas Spore and Malleable Goo) in action. 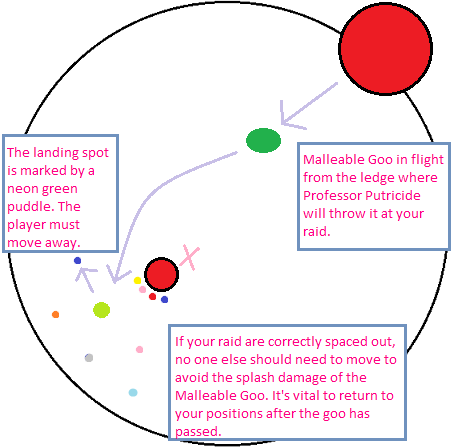 You can clearly see the ranged DPS stacking together to ensure they all receive the inoculation, whilst also steering clear of the neon puddle on the ground marking the landing point of the incoming Malleable Goo. This is one of the easier heroic modes, particularly if your raid (and specifically, your ranged DPS and healers) are already accustomed to being spread out throughout the fight. This is precisely why I encourage the positioning featured in my strategy guide for the normal version of this encounter. 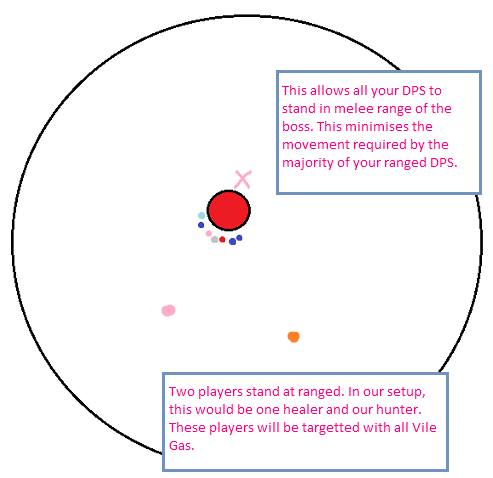 Your main concern as a ranged DPS is avoiding the Malleable Goo. The casting speed debuff is extreme and with a twelve second duration, it’s a huge loss in DPS. Should multiple DPS be hit by this, you will fail the enrage timer. The key to this encounter is good raid awareness, both to monitor the path of the Malleable Goo and ensure that you’re receiving the inoculation debuff. Whilst it may initially seem quite chaotic, it’s an easy fight and shouldn’t take your guild long to master. Festergut is one of three bosses in the plagueworks wing of Icecrown Citadel. While there are some mechanics you need to be aware of, this boss is a relatively straight forward DPS check and, as such, if you’re lucky with the RNG factors and don’t need to move too much, it can be great fun as a ranged DPS. 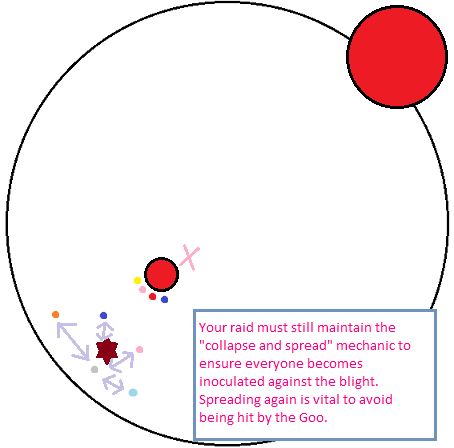 The above diagram shows the positioning of your raid for the majority of this encounter. 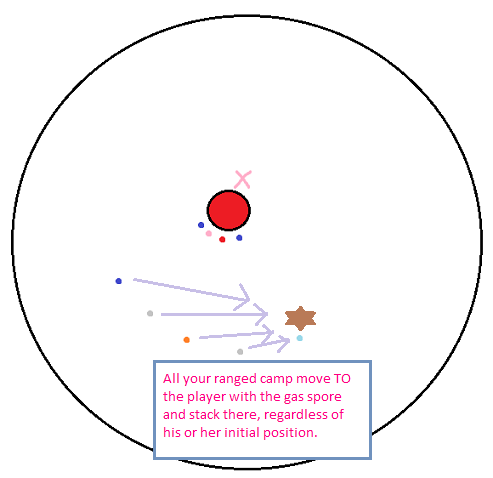 Some movement is necessary to deal with a mechanic known as Gas Spore. This will be explained in the next section. It’s vital that you spread out and return to your designated spot. Standing too close to another player will cause multiple players to be affected by Vile Gas and isn’t something you want. At worst, this can result in multiple DPS or healers being taken out of the fight for a few seconds and you could miss the enrage. Gaseous Blight is a room wide aura so nothing you can actively react to. However, for the sake of being aware of what is damaging you at any given time, it deserves a mention. At the start of the fight, the room will be flooded with Gaseous Blight. Initially, this aura will deal between 4,388 to 4,612 shadow damage to all nearby players. While not directly related to the role of an elemental shaman, it’s worth noting that every inhale causes Festergut to deal higher levels of damage and also increases his attack speed. This spell occurs 15 seconds after the Inhaled Blight. Festergut will exhale and release the Gaseous Blight back into the room dealing high amounts of shadow damage. How high? We’re talking 48,750 to 51,250 of shadow damage to the entire raid. Fear not, there is a mechanic in place to deal with this insane damage. Two random players (in ten man mode) will be afflicted with a gas spore. It’s very easy to spot, you have a giant brown spiky blob placed over your head (and boss mods announce this clearly also). This spore will explode after 12 seconds dealing a small amount of damage to all nearby players. Upon exploding, players will receive a debuff called Blighted Spores. This debuff inflicts a small amount of damage for 6 seconds. 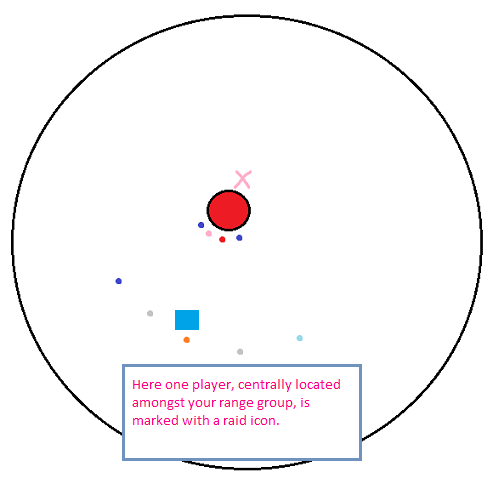 Upon receiving this debuff, the players should return to their original raid position. When the duration of Blight Spores expires, they will become Inoculated. This increases the shadow resistance of the player by 25%. It can stack upto three times and this is precisely how you deal with the large amounts of damage dealt by Gaseous Blight. 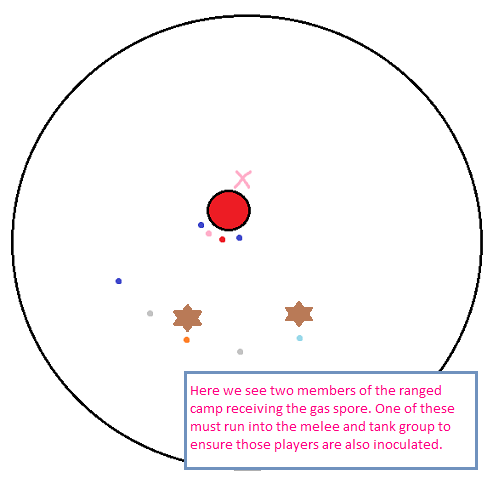 The Gas Spore has a rather small range when it explodes, thus, to ensure everyone in the raid receives the debuff and ultimately becomes inoculated, your ranged and healers will stack together under one spore and your melee and tanks under the second. There are two different methods for dealing with the movement required by the Gas Spore mechanic. I’ll detail these in the next section. 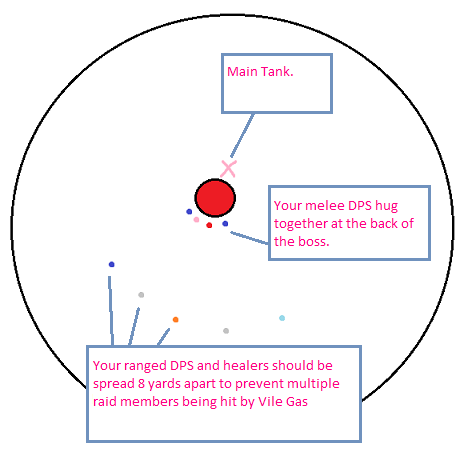 The reason for maintaining an 8 yards distance between all healers and casters is to handle the Vile Gas mechanic. This spell is an instant cast with an 8 yard radius. It inflicts 3,900 to 4,100 shadow damage every 2 seconds for a total of 6 seconds duration. Whilst the damage itself is annoying, the biggest problem with Vile Gas is the disorientation effect it places on any players in range. This leaves them unable to do anything for the full six seconds duration. Should multiple players be hit by this, it can potentially leave you struggling for DPS or lacking heals. As such, it’s vital that when you move to receive the debuff from a Gas Spore explosion, you return to your designated position immediately. Be aware of those around you and be prepared to move slightly to prevent yourself being hit by this if someone else is out of position. With the positioning I detailed at the start you have two main “camps” during this encounter. Your melee are tightly stacked under Festergut and your ranged DPS and healers are spread loosely closer to the door. In the ten man mode of this encounter, two people will be targeted with a Gas Spore. This equates to one spore being used to protect your tanks and melee and the second being used to inoculate your healers and ranged DPS. Due to the relatively small radius of the spore when it explodes, these two camps need to stack to ensure everyone receives the debuff. Obviously, as your ranged DPS and healers need to spread out to avoid the Vile Gas, they also have to move together for the Gas Spore. You need to know in advance how this movement is going to occur otherwise you’ll have healers and casters running around randomly and run the risk of someone not gaining the inoculation debuff. As this is essentially a DPS fight, you can’t afford to lose people to the AoE. There are two different strategies you can employ to deal with this movement. Firstly, you can mark a player in the ranged camp and have all your healers and ranged DPS move to this mark when the Gas Spore appears. Everyone quite simply collapses together onto the marked person. If you decide to opt for this strategy, then it obviously makes the most sense for the marked person to stand in the centre of your ranged group. 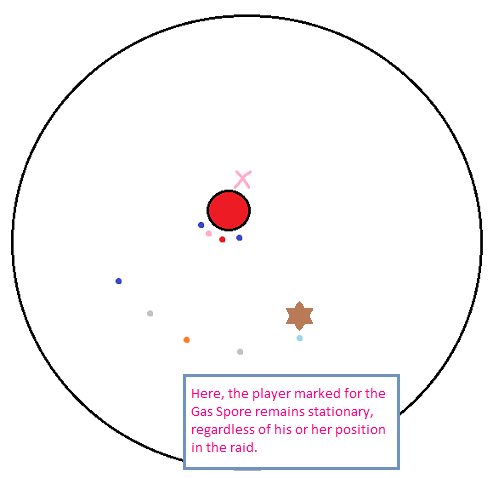 Alternatively, you can agree that everyone should move to the player with the gas spore while the targeted player remains stationary. There are advantages and disadvantages to both of the above strategies. If you’re struggling to reach the enrage timer or cutting it very fine, I would personally suggest opting for the first method. This allows you to mark your highest DPS player and ensures this player should never have to move, allowing them to maximise their DPS. 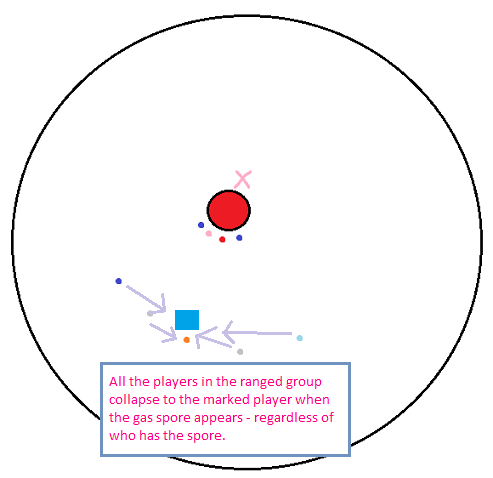 The spore is placed on two random players and, as such, this can result in two players in the same camp being marked. That is to say, two members of your melee camp both receiving the Gas Spore or two members of your ranged camp. Due to the possibility of this event occurring, I would recommend good ventrillo communication as it’s essential that one player moves and delivers the debuff to your other camp. No specific totem configuration is required for this encounter so use your usual raid totems. If you’re free to use offensive totems, then this is an ideal encounter to be popping your fire elemental totem as aside from the relatively small amounts of movement, it’s a pure DPS check. We pop heroism very early in this fight but as always, check with your raid leader for his or her preference. Once your raid have successfully learnt to handle the movement required by the Gas Spore mechanic, this fight will be a walk over for you. There is a second type of raid positioning that can be used and indeed, my own guild utilised this method itself. Personally, I would recommend the above method for the simple reason that when you progress onto the heroic mode of this encounter, your raid will already be accustomed to the positioning required. Never the less, I will detail this tactic also. 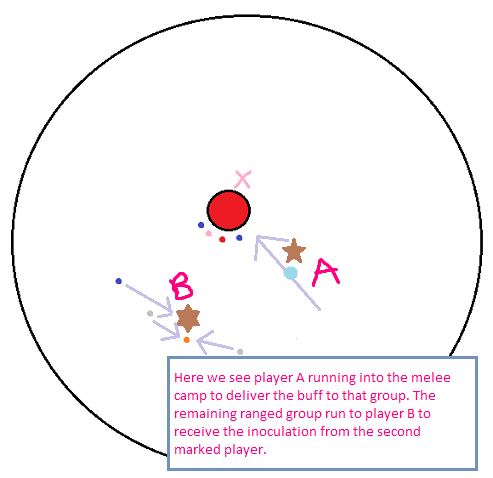 This tactic sees most of your raid standing in melee range of Festergut. 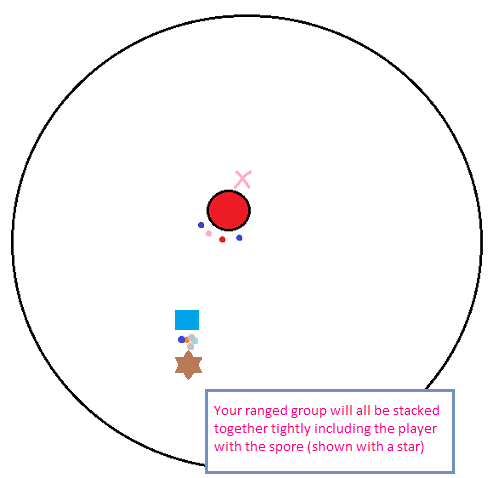 Three players will be in the ranged camp. If you have a hunter in your raid setup the naturally, this should be one of those players. These three players will draw all of the Vile Gas debuffs. Your can roughly see the alternative positioning in the screenshot above. You’ll notice our druid healer stood at a distance to the right of the shot whilst nearly all the DPS (myself included playing as elemental) are in melee range of Festergut.